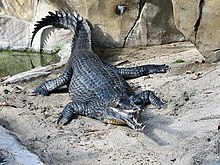 The gharial (Gavialis gangeticus), sometimes called the Indian gharial,common gharial or gavial, is one of two surviving members of the family Gavialidae. They are a group of crocodile-like reptiles with long, narrow jaws. The gharial is the second-longest of all living crocodilians: a large male can be nearly six meters in length. Only saltwater crocodiles and the Nile crocodile can grow larger. Northern Indian subcontinent: Bhutan (almost extinct), Bangladesh (close to extinction), India (present in small numbers and increasing), Myanmar (possibly extinct), Nepal, Pakistan (close to extinction). Usually found in the river systems of Indus (Pakistan) and the Brahmaputra (Bangladesh, Bhutan & North eastern India), the Ganges (Bangladesh, India & Nepal), and the Mahanadi River (in the rainforest biome) (India). Small numbers are in Kaladan and the Ayeyarwady in Myanmar. It is sympatric, in respective areas, with the mugger crocodile (Crocodylus palustris) and the saltwater crocodile (Crocodylus porosus). The Gharial is not a man-eater. Despite its immense size, its thin, fragile jaws make it physically incapable of devouring any large animal, including a human being. The myth that gharials eat humans may come partly from their similar appearance to crocodiles and because jewelry has been found in the digestive system. However, the gharial may have swallowed this jewelry while scavenging corpses or because used to aid digestion or buoyancy management. ↑ 2.0 2.1 Boulenger, G. A. 1890. Fauna of British India. Reptilia and Batrachia. ↑ "Choudhury, B.C., Singh, L.A.K., Rao, R.J., Basu, D., Sharma, R.K., Hussain, S.A., Andrews, H.V., Whitaker, N., Whitaker, R., Lenin, J., Maskey, T., Cadi, A., Rashid, S.M.A., Choudhury, A.A., Dahal, B., Win Ko Ko, U., Thorbjarnarson, J & Ross, J.P. 2007. Gavialis gangeticus. In: IUCN 2007. 2007 IUCN Red List of Threatened Species. <www.iucnredlist.org>>". Wikimedia Commons has media related to Gharial.